We'll start with the bottom five spots at the end of the tournament. These are of course personal opinions and not meant to offend anyone, but offered simply as an independent analysis from someone who saw the whole tournament and was keen to evaluate the sides compared with what was predicted. And remember that almost all sides were considered to have improved greatly since 2002. Next to each side is listed the predicted finishing position, based on the averaged tips of World Footy News writers, and then removing Denmark and Nauru who withdrew after the selections were made. The Brits took this competition very seriously and had a great asset in former AFL player Matt Connell as coach. Although the players were quietly confident they probably weren't rated amongst the top contenders. In their first match they were well beaten by New Zealand, who we later realised were a level above everyone else. Next up Samoa and a crushing loss meant the British tilt had already been derailed. A big loss to PNG followed, before a two point thriller against Canada saw them get their first points in what was a top effort - it isn't easy to reverse a streak in the middle of a tournament. A good win over Japan followed, before Samoa did enough to beat them a second time. A look back at their draw shows that Britain's first three games were against ultimately 1st, 5th and 2nd. That was always going to be tough, although finishing 6th probably was a good result anyway, with Samoa a notch above. There's no doubt the Northwind copped the worst draw of the tournament and were less than amused - yet they pushed every side, only to lose all four early round matches. First up it was Ireland (ultimately 4th), then PNG (2nd), Samoa (5th) then Great Britain (6th). In a combination of poor play by Samoa and some sensational goalkicking by Team Canada, the North Americans looked to have their Round 3 match in the bag, up 5 goals to nil, only to have the Samoans storm home in a brilliant display. Against Great Britain it was a dour struggle and perhaps the loss two days earlier had broken their hearts (don't shoot the messenger Britain, it just looked that way to me), and the Northwind suffered another small loss. A forfeit win over Spain was less than satisfying, but in their final match Canada did the job against South Africa. No doubt they had expected to finish higher and probably had a few chances they didn't convert, but overall the Northwind just didn't seem to put it together. Again, as with Britain, the issue comes up that in determining International Cup success, we have to measure improvement relative to everyone else. It should also be noted that Canada lost three players 6'3" (190cm) and above in the days and weeks before the series started, which may have severely hampered their game plan. All round a very competitive series and probably deserved a slightly higher finish, but then they lost to Britain who came in 6th so as with most teams, their final position was about right. Two wins after none last time was a good result for Africa's only national Aussie Rules side. With the addition of some quality big Afrikaaner key position players the Buffaloes defeated Japan and Spain, but lost to the USA (although were competitive), Ireland (badly) and Samoa (comfortable margin) before giving Canada a fright in the 7-8 play-off. Overall it was a good step forward for them, although after their first two wins they probably would have hoped to get one more at the end. Having secured independent funding and developed junior programs for several years, AFL South Africa have now won more significant AFL backing and have plans to dramatically increase junior numbers. The first fruits of that may be felt in 2008, although in the short term a key will be keeping the white players in the program, perhaps through a short university competition, so that they continue to supplement the good and growing number of black players in the game. A good tournament and a stepping stone to a bright future. Coach Troy Beard has done tremendous things for footy in Japan, and he is clearly passionate about his adopted nation. He also knows how to drum up some publicity and the media were never far away when Japan was playing. After successful tours of Australia bigger things were expected compared with 2002, but there was always the nagging doubt that they would lack key position size. Although the Samurai won their first International Cup match, defeating Spain (twice) and lost a tight one to South Africa, they would be disappointed at not climbing higher (their other losses were sizeable, to New Zealand, Ireland and Great Britain). When allowed to run free their short passing game is very impressive, with the skill level quite high, but at this Cup most sides were very dedicated and very fit, and didn't allow the Japanese any space. This was exacerbated by the smaller fields at Murphy Reserve. Their smaller body size was targetted by other teams and it took its toll. From all reports the Samurai are much improved, but will need to find some taller and stronger players to give them the balance all good footy sides need. Quite simply Spain were winners for turning up. 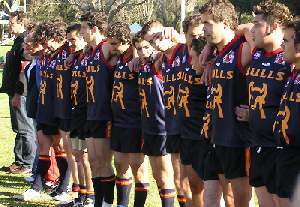 Australian football is very young in their country and their national side was selected almost entirely from the Madrid Bears club. Given that, and that their squad was smaller in number than other nations', they battled through the tournament with great spirit. There were a few guys in their side who seemed to be as much Aussie as Spanish, but presumably they passed the qualifying criteria, and no one seemed to mind too much since they didn't really look like scoring a win (though they were competitive) and it was just great to have them along. It's well documented that Japan's coach stated that although Spain were well behind the other teams, they were better than his own side and South Africa were back in 2002. Hopefully the Bulls will return again in 2008 with a stronger team. To do so, and keep pace with the increasing standard, they'll need to expand their competition at home to have more players, although there are suggestions they favour a one club model. That would make them unique in the upper echelons of international footy, but it would be difficult to see how they could generate the numbers to climb off the bottom of the ladder. However that is mostly speculation and the main thing to report here is that Spain were a welcome addition to the Cup, adding colour and interest on and off the field. Whilst not winning a match (losing to Japan twice, New Zealand, the USA, South Africa, and forfeiting to Canada when numbers ran out) the Bulls were competitive enough to ensure they lost no supporters - and they were indeed one of the better supported countries.